Garden incinerators & Fire Pits are delighted to offer the famous Gardeco Cover-fb50 Fire Bowl Fire Pit Cover Upto 50cm Diameter - Green. With so many on offer today, it is good to have a make you can recognise. The Gardeco Cover-fb50 Fire Bowl Fire Pit Cover Upto 50cm Diameter - Green is certainly that and will be a superb acquisition. 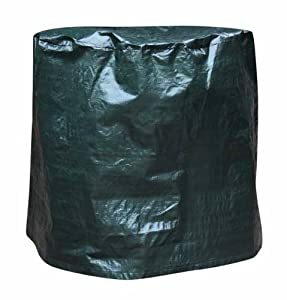 For this great price, the Gardeco Cover-fb50 Fire Bowl Fire Pit Cover Upto 50cm Diameter - Green is highly respected and is always a regular choice amongst most people. Gardeco have provided some excellent touches and this means great value for money. Extend the shelf life of your fire bowl with this practical Cover. Clay fire bowls are often susceptible to cracks and chips when they get wet or frozen this cover can protect your fire bowl and prevent it from suffering any weather-related damage. Cast iron and steel fire bowls will rust if left outside all year this cover can prevent this from happening - resulting in a product that will stay in good condition for a longer period of time. Made with woven polypropylene which is both UV and tear-resistant the cover is practical durable and features strong brass eyelets and tie-string for a good fit. Suitable for Fire Bowls Fire Pits and Fire Baskets Approximate dimensions: Diameter - 50cm Height - 50cm Take a look at our range of Gardeco Chimineas Fireplaces and Fire Accessories.